Lush green fields make up the scenery of the prairie landscape until the fields suddenly hit the base of the mountain range in Waterton Lakes National Park in Southern Alberta. 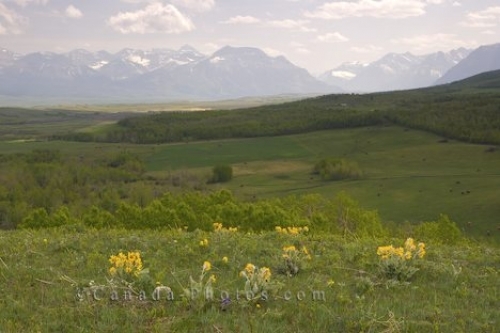 In the summer months, the scenery at a viewpoint along Highway 6 in Southern Alberta, Canada overlooks the prairie landscape made up of lush greenery, wildflowers and a massive mountain range. The Rocky Mountains suddenly rise from the prairie fields with no foothills and the roads become a lot steeper fairly quickly. Waterton Lakes National Park is the area of "Where the Mountains Meet the Prairies" which has some of the most stunning scenery as you travel across Canada. "Where the Mountains meet the Prairies", view of Waterton Lakes National Park Mountain Range along Highway 6 in Southern Alberta, Alberta, Canada. Picture of the prairie scenery in Southern Alberta, Canada at an area known as Where the Mountains Meet the Prairies.